There is definitely no lack of options for dining and drinking in the City of Lights. It can, however, prove challenging to find those special places that leave us feeling nurtured, satisfied and guilt-free. Below - as part of our Paris Lifestyle Guide series -, our selection of some of our go-to spots around town, for breakfast, lunch, snacks, dinner and dessert. Service with a smile guaranteed. Mokonuts husband and wife team Moko Hirayama (ex-Yam’Tcha, La Durée, Blé Sucré) and Omar Koreitem (ex-Daniel NYC, Sergent Recruteur Paris) serve up Middle Eastern mashup cuisine and sweets at this diminutive 20-top café tucked away on a side street east of Bastille, a few blocks from the Square Trousseau. Omar’s Lebanese roots and savoury skills combine with Moko’s Japanese influence and inspired baking, resulting in an eclectic yet harmonious menu that changes daily but likely to include creative starters like labné topped with roasted beets and za’atar accompanied by homemade bread, radishes with pesto and feta; mains like pan-fried pollock, white beans and and shaved black truffles, and handmade garganelli verde pasta with ragu. And the desserts! Think: miso-sesame or chocolate mole cookies with goji berries, flourless chocolate layer cake with coffee mascarpone cream, a crostata de nefle with buckwheat flour and apricots…. Wash it all down with a glass of biodynamic French wine, orange blossom lemonade, a cup of craft coffee, or all of the above. When it comes to dietary preferences and requirements (desserts excluded), the duo is very accommodating and will suggest a vegetarian option (or gluten/dairy-free) upon request - even if it means improvising on the spot. Open morning till late afternoon, be sure to reserve in advance for lunch or consider booking out the place for a private dinner for 6 to 12 people. Wild & The Moon is based on the simple belief that food should be good for you, good for the planet and good for the palate. This translates as food and juices that are organic, plant-based, gluten-free and unpasteurized. Envisioned by Inside/Out expert Emma Sawko as a “chill place that reminds me of the laid back West Coast culture with cool NYC vibes,” the interior of the Paris flagship on rue Charlot in the North Marais combines reclaimed wood and other recycled materials, lots of vegetation and vintage French industrial stools and tables. It’s always hard to choose between the array of cold-pressed juices, hot beverages - from Bulletproof Coffee to Paris’ best Golden Mylk -, snacks like avocado toast on raw crackers made from the juice pulp, buckwheat granola, daily dishes like curried vegetables, warm soups and spirulina matcha bars. And while the price tag may be a bit hard to digest, the indulgence will be both guilt free and nourishing for body and soul. The only “ish”? The lines and competition for a seat. Various locations, including Paris Marais, Le Tigre, Lafayette Anticipations and ... Dubai. Nubio is a Parisian juice brand, with created by two entrepreneurs, Claire Nouy and Gabrielle Rotger. From their pretty little corner lab in the 11th arrondissement (near Faidherbe Chaligny ... and Mokonuts - see above), the duo oversees the daily creation of cold press juices, bottled up into attractive packaging and prepped for dispatch to prestigious spots like the Hôtel Bachaumont, the Grand Pigalle Hotel, Café Charlot or for pick up (by pre-order online only). For those looking for a program, Nubio proposes several options. The Nouveau Départ targets newbies, while the Intense program is recommended for more experienced juicers, those who prep their bodies in advance in search of more holistic results, such as "hormonal balance, cleansing and hydration." Also available online for pick-up or delivery: granola bars, herbal tea blends, salads and soups. All certified organic, bien sûr. Otium is an adorable cantine located on Rue Rochefoucauld in the 9th arrondissement. Initially on the SoPi circuit through the success of their cold press juices, the culinary options quickly took over. Vegans, vegetarians and even carnivores are all sure to find something to their liking. The food is fresh and healthful and the portions generous, so diners leave feeling satisfied, never deprived. As mains: palak paneer, colorful veggie bowls and inventive currys. Try also their homemade focaccia, chia pudding or granola parfait for breakfast and don't miss the daily deserts, like moist banana bread and delicious tarts. Co-founder Kaitlyn Reinhart certainly adds to the charm, always warm and welcoming, magically finding moment to catch up while simultaneously seating customers, prepping plates and taking order. Opened just over a year ago by the former founders of Soya, Primeur is located in the 20th arrondissement, in the midst of the gastro bistros - Verre Volé and Le Dauphin - and dowdy Asian joints between the Canal Saint Martin and Belleville. This attractive vegetarian and vegan "cantine bio" proposes fresh combos prepared in the wok, burgers, lasagne and even their own version of Shepard's Pie. The portions are hearty, the service polite and the décor pure without being cold. Bonus points for the outdoor seating. Ellsworth is the third outpost from American expats Braden Perkins and Laura Adrian, who own the critically-acclaimed Verjus Restaurant and Verjus Wine Bar around the corner. The faux-country fare includes starters and mains such as buttermilk fried chicken; beets with barley and goat cheese; soft boiled egg, kale, leeks and comté cheese; and desserts like raw milk panna cotta with limequat and a honey crisp and the made-to-order molten chocolate cake with vanilla ice cream that provide a balance between comfort and refinement . The Sunday brunch is also a good spot to fuel up before a day at the Louvre...or strolling around Palais Royal. Additionally, the staff is as delectable as the food and well-versed in dietary requirements or preferences. Included in contributor Kim Laidlaw’s Paris Feel Good guide, the Abattoir Végétal (which translates as “vegetable slaughterhouse”) is a vegan bistro in North Montmartre, serving healthy, organic, seasonal and mainly-locavore fare. The husband-and-wife team behind the venture came up with the name as the shop was formerly a butcher’s - which seems wonderfully poetic for its new meat-free reincarnation. Alongside three-course meals, the also serve cold pressed juice, a matcha latte and organic champagne, to be savored in the immensely Instagrammable setting filled with plants, marble-topped tables and copper and velvet details. 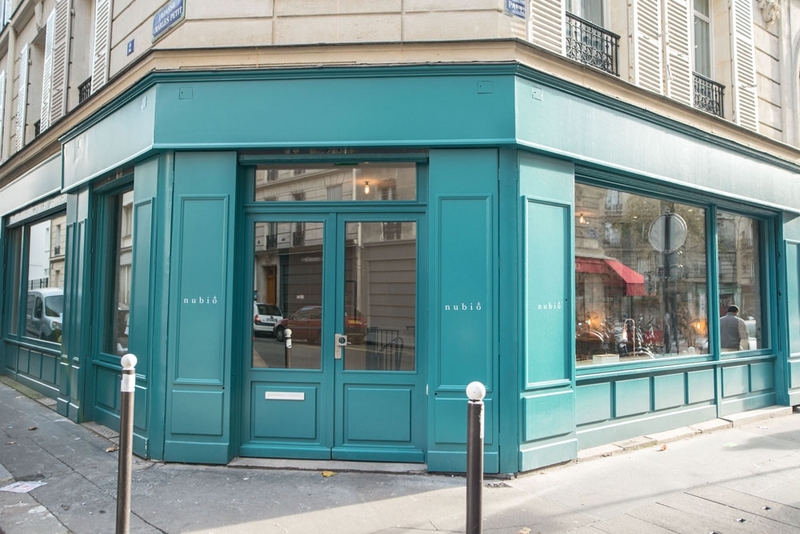 Noglu is a gluten-free restaurant, bakery and grocer with has two brick and mortar locations in Paris - the original in the pretty Passage des Panoramas, and the latest on Rue de Grenelle in the chic 7th arrondissement. Since opening in 2012, Noglu quickly proved that eating gluten free did not have to be synonymous with lack of flavor or inventiveness. Breakfast, lunch and dinners are all tasty and generous. (We love it for breakfast and lunch meetings.) The ingredients are organic and all products are prepared on site daily. The menu changes daily but tends to include classics such as carrot cake, scones, burger (vegetarian or classic), quiche, fresh fish dishes and salads. And always vegetarian and dairy-free options as well. We’re just going to come out and say it: Chambelland is one of the best, if not the best, gluten-free bakeries we have ever known. So good that Parisian gluten’o’files are known to regularly flock to their cozy café in the heart of the Popincourt Village, just off Rue Oberkampf for their pain d’athlètes (a dense blend with fruits and nuts), lemon tarts and financiers. We know international editors who, shortly after landing in Paris, Uber over to stock up on the crusty multi-grain loaves for meals in their Airbnb abodes. And what about the women who barely eat any bread at all who splurge on the decadent olive oil focaccia - and hey, why not throw in some sugary chouquettes pastries for an office meeting, or some bittersweet chocolate cakes to take to tonight’s dinner party? What’s the secret? Their fresh yeast and organic milled flours are produced in a mill built from scratch by founders Nathaniel Doboin and Thomas Teffri-Chambelland. The small on site café is worth the visit for salad, soup, coffee, tea and, of course, flour-based sweets and sandwiches (with vegetarian options to boot). Revered chef Jody William first opened her French-inspired gastrothèque in New York City’s Greenwich Village, then followed suite with a Paris outpost. In keeping with bistro culture, this charming yet unimposing bar-café-restaurant is open non-stop from AM to after midnight, serving homemade almond brioches, espresso, Croque Madame, roasted chicken, French-style Shepherd's pie, cocktails and a solid selection of vegetarian options. All of Buvette's ingredients are sourced from the best suppliers around like Terroirs d’Avenir, Louis Ospital’s basque farm, Kalios and the Delin fromagerie. And a particularly special mention for the friendly, smiling and attentive staff.